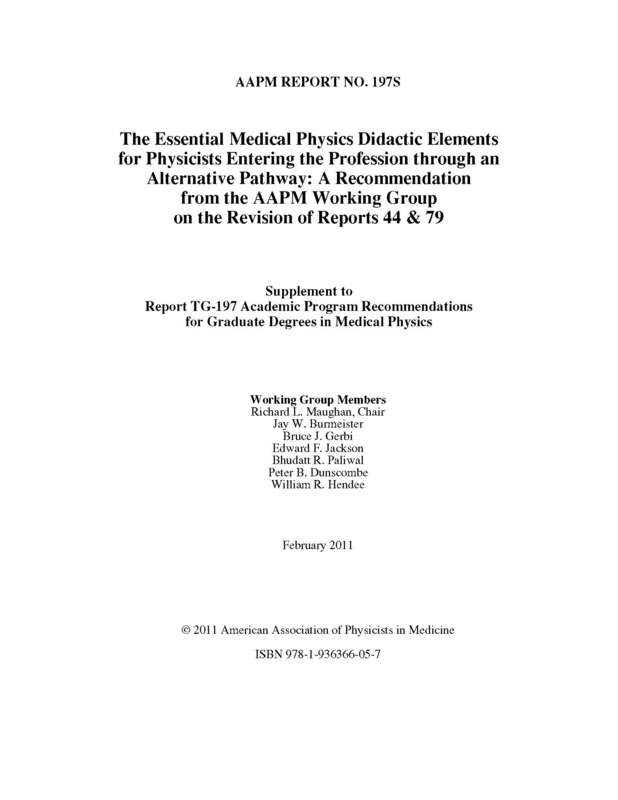 The American Association of Physicists in Medicine (AAPM) Working Group on the Revision of Report 44 (WGRR44) has been charged with the task of recommending the minimum didactic medical physics education requirements for physicists seeking to enter a Medical Physics Residency program accredited by the Commission on the Accreditation of Medical Physics Educational Programs (CAMPEP). It is required that all CAMPEP-approved graduate education programs meet these minimum didactic requirements, so that their graduates are eligible to enter CAMPEP-accredited medical physics residency programs. However, the primary purpose of separately and clearly defining the minimum didactic requirements is to give unambiguous guidance to those wishing to enter a CAMPEP-accredited residency through an alternative pathway, i.e., without completing a graduate degree in medical physics but with a graduate degree in some other appropriate field (e.g., physics, electrical engineering, etc.). Defining academic entrance requirements for CAMPEP-accredited residency programs is an important issue, since beginning in 2014 all medical physicists wishing to take the American Board of Radiology (ABR) certification exam in any of the three sub-specialties of radiologic physics (Therapeutic Radiologic Physics, Diagnostic Radiologic Physics, and Medical Nuclear Physics) will be required to have successfully completed a CAMPEP-accredited medical physics residency program to be eligible for Part 2 of the examination. There are also undergraduate prerequisite physics course requirements defined by the ABR and these are not addressed in this document.